Everyone loves power tools. The GDAL and OGR utilities are the power tools of the GIS world, and best of all, they're free. The Geospatial Data Abstraction Library (GDAL), including its subproject OGR, is the preeminent open source data access library. It is used behind most of the open source geospatial applications and also sits behind many of the leading proprietary GIS applications on the market today. Along with the programming libraries come several powerful command line utilities, intended to be run by being typed into a terminal or command prompt window. The utilities include tools for examining, converting, transforming, building and analysing data. 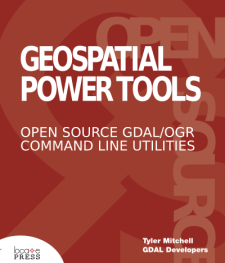 This book is a collection of the GDAL and OGR documentation, but also includes substantial new content designed to help guide you in using the utilities to solve your current data problems. Once you get a taste of the power the GDAL/OGR suite provides, you'll wonder how you ever got along without them. This book will get you on the fast track to becoming more efficient in your GIS data processing efforts. If you would like to receive updates about this title, please register.